A well-cared-for wooden spoon not only looks great in the kitchen but will also last longer than any plastic utensil available. Unfortunately, most people shy away from wooden utensils for a number of reasons. They crack, they cause splinters or they start to smell bad. A well-cared-for wooden spoon not only looks great in the kitchen but will also last longer than any plastic utensil available. Unfortunately, most people shy away from wooden utensils for a number of reasons. They crack, they cause splinters or they start to smell bad. But with the proper care, all of this can be avoided and your spoons can last a lifetime. Never put your wooden utensils in the dishwasher. The heat from the machine will cause the wood to split, and once it is cracked, it cannot be restored. Also, never allow wooden utensils to soak in the kitchen sink, especially in dirty water. 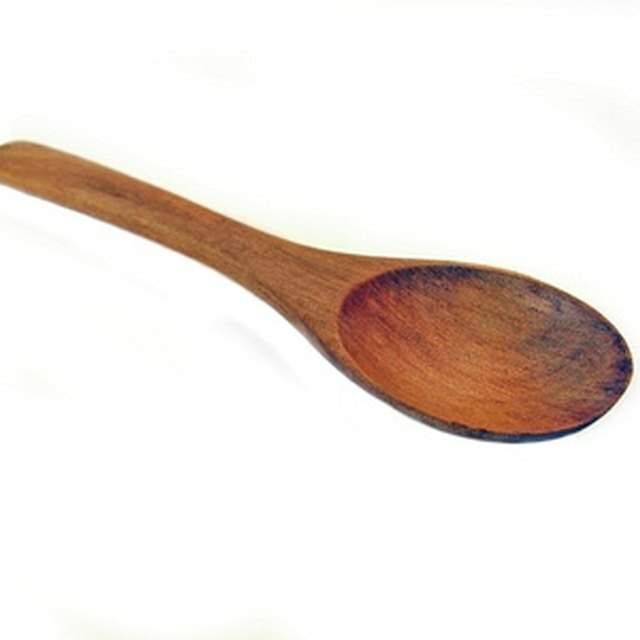 It will damage the wood beyond restoration, and even if the wood is not soaked long enough to cause damage, the smell of the dirty water will penetrate the grain, causing one reason for old, smelly spoons. With the dishwasher and long soaking time off-limits, many people are unsure how to go about cleaning their spoons, especially after a particularly messy meal. Water is not completely off-limits. The spoon can be submerged in water as long as it is not left there for a long period of time. Take a sponge with a very miniscule amount of soap in it and rub the food off of the spoon. Rinse the spoon until it is food- and soap-free. Then rub the excess water off with a towel and allow it to air dry. Your spoon will not have a reason to become smelly and more importantly, it will not become cracked and damaged. To ensure that your spoon stays as fresh and beautiful as the day you bought it, you must take time every 2 to 3 months to rub oil into the grain. Mineral oil is the all-around best choice for your utensils. Food-based oil, such as vegetable or olive oil, would seem like a good choice. But any food-based oil, no matter how nonperishable it may seem, will eventually go rancid. This is the other reason for an old, smelly spoon. Mineral oil is not food-based and is safe to use on wooden utensils. Pour a nice but not generous amount onto a towel and rub the oil into the grain until the wood darkens. Generally, two to three coats are best. You may notice with new spoons that they feel splintered and grainy. This is called grain-raise. Take 400- to 600-grit sandpaper and gently rub away the grain until it is smooth. Once the spoon is properly sanded, grain-raise will cease and sanding will no longer be needed.